These spreads are great for parties, to spice up your cracker or add zest to your next sandwich. 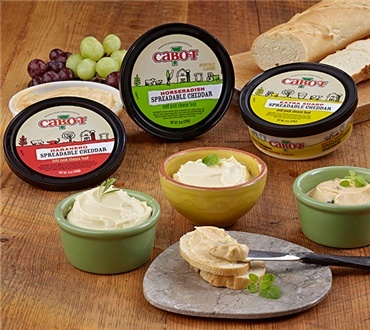 Extra Sharp Spread - We've brought spreadable convenience to all the full, rich flavor of "The World's Best Cheddar." Great in sandwiches, and perfect for spreading on crackers - or just sampling with a spoon. Horseradish Spread - Pungent! Rich! Creamy! They all come together in this potent spreadable cheddar that's perfect for true horseradish lovers - or anyone who loves big-flavored cheese. Port Wine Spread - Vermont cheese meets New York wine in this classic combination that is classy enough for cocktail parties, yet tasty enough to enjoy anytime. Serve it simply, with crackers or crostini - or stuff it into tasty hollows, like Spanish olives or sweet pepper halves. Each Tub is 8 oz. Easily the best cheese spread I'we ever tasted. Now that I know it exists, I will be ordering when I need to replenish. Gifts, Hors d'oeuvre, With a glass of wine and friends!! Love the taste of this cheese, It is very flavorful. THIS CHEESE SPREAD IS GREAT!! It's very tasty and would buy again! !